The court hearing between Portsmouth FC's administrators and Portpin is underway. However, due to a 'significant change' administrators are seeking an adjournment. The Judge is considering this request and is due to report back at 1230. The hearing to determine the proposed sale of Fratton Park, scheduled for December 13 and 14 at the High Court in London, has been adjourned. It's not clear at the moment why there is a delay. The administrator says the hearing is critical in deciding the future of Portsmouth Football Club. If the court agrees with the sale value of Fratton Park, they can sell the club as a going concern to the PST; if they lose, liquidation will become the most likely option. What started as a protest organised by SOS Pompey in January 2010 has become the catalyst for a revolution. 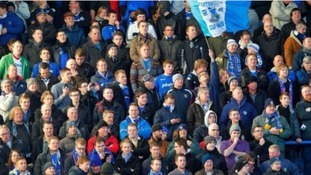 The fantastic work conducted by everyone connected to the Pompey Supporters Trust has changed the face of modern football. The fans have come together to pledge their support, not just with their hearts and minds, but with their hard earned savings, to back what will be the largest fan buyout this country has ever seen. We now have the opportunity to show every other club that community ownership is possible. Fans across the country will point towards Fratton Park and say “we can do that”. Portsmouth FC has always been the heartbeat of our city, and today is a great day for both the club and city, and together we have shown that we can overcome the odds and that we will take our famous club forward. It must be realised that there is much hard work to be done by us all to turn our wonderful club around, yet we can and will restore Pompey back to its rightful place. However, today, Pompey fans can rejoice in the knowledge, that whatever the future holds we are now in charge of our own destiny. The Pompey Supporters' Trust (PST) has responded to today's news that it is has been chosen by the administrators of Portsmouth Football Club as the preferred bidder to buy the team. Those behind the Trust thanked the club's fans, and said they wanted to create Britain's largest community club and allow the fans to take control of the club's destiny, protecting the legacy for generations to come. “We are energised that our bid, by the fans and for the fans, has been preferred by the club’s administrators. Although there remains a huge amount of work to be done to ensure the right outcome for the club, we are confident we will succeed. “This is a pivotal moment in the history of Portsmouth Football Club, but also to the wider footballing world. I’d like to take this opportunity to thank the fans for their continued support of the bid and of the club throughout this process, and for believing in what a true community club can offer. “Pompey has long been renowned as a pioneering club and this decision keeps that tradition alive. While we look to support this off the pitch, we encouraging fans to ‘Pack the Park’ this weekend and show Michael Appleton and his players the support they so rightly deserve on the pitch. Pompey fans have been given a massive boost today having been named as preferred bidders to buy their club. The Portsmouth Supporters Trust has been nominated as preferred bidder to buy the football club, putting the fans consortium in pole position ahead of Portpin. The Pompey Supporters' Trust is now in prime position to take over Portsmouth Football Club. The Football League have failed to approve a bid by the 'Portpin' firm, headed by the club's former owner Balram Chanrai. This leaves the Pompey Supporters' Trust as the front runner to take over the side.